Process your thoughts, diffuse stress and find an optimistic perspective in just a few minutes. For many, stress is an accepted part of daily life, whether it’s triggered by a mile-long to-do list at work, a schedule packed full of family commitments or the stream of never-ending bills in your mailbox (or, likely, a combination of all three). Research suggests that over the past decade there has been a sharp rise in mental-health related issues, like stress and anxiety. A survey conducted by the American Psychological Association found that 31 percent of respondents saw an increase in their stress levels in 2016 and 2017, with 20 percent reporting experiencing extreme stress. 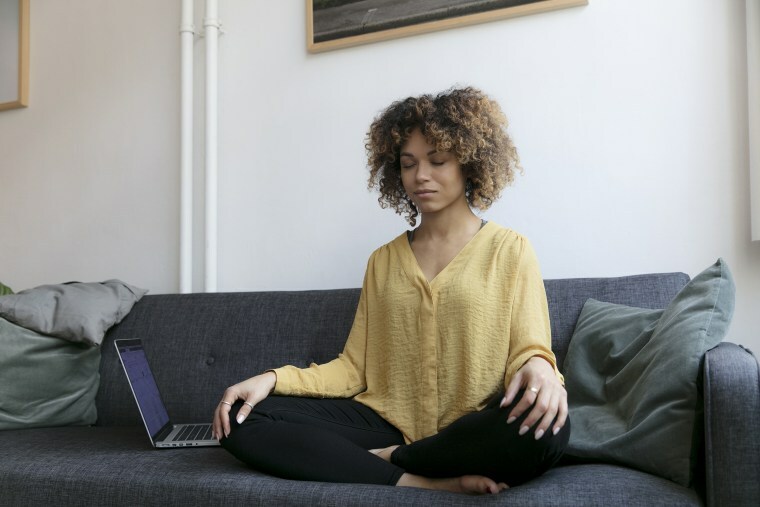 Poppy Jamie, entrepreneur, TV personality and creator of the mindfulness app “Happy, Not Perfect,” is no stranger to the severe health effects of a high-stress lifestyle. “[Thinking about stress] started for me at a young age, because my mother is a psychotherapist and my father is an entrepreneur who suffered from severe stress and anxiety,” says Jamie. As she entered the workforce, Jamie began to struggle with stress-related health issues of her own. “I was a TV host for seven years and I started my own business and I was trying to do so much, I was very much my father’s daughter feeling stressed and anxious,” she says. We are have these up and down emotional lives but weren’t given the tools to be able to deal with it. “The most successful people, even back to the ancient Greeks, understand that you need to look after your mind and create mindful rituals to help you feel better, make better decisions, feel balanced and manage stress when you’re under pressure,” says Jamie. So she took matters into her own hands and began to develop an app filled with tools she knew she (and millions of other people) needed to take a breather, de-stress and find a happier, more centered mental space. And “Happy, Not Perfect” was born. Created with UCLA neuroscientists, she says the app combines scientifically-proven methods from positive neuroscience, plus mindfulness rituals and practices and modern gamification, to activate different parts of the brain and promote the release of serotonin and dopamine. “We understand what it’s like to go to the gym a few times a week and look after our physical bodies, but we need to start looking after our minds — they’ve never been under this much strain, where the world is quicker than ever." Just like our body, our mind needs regular exercise and daily attention, says Jamie. "To be able to manage your mind is a skill like any other skill and we’ve forgotten that. Why wait until you feel terrible to do it? Our mind needs regular exercise and daily attention. To be able to manage your mind is a skill. By taking a time out each day to perform some brain training exercises, Jamie’s hope is that the simple process will help you accept when thing aren’t perfect and give you a different metric for success (one that supports happiness rather than perfection, which will ultimately make you happier in the long run). "By accepting how you feel, studies show that you start reducing the emotional impact,” says Jamie. And this seven-step process is designed to walk you through this journey of checking in with yourself, processing the emotions and letting them go. Ready to give it a try? Follow these seven simple steps to help train your mind to release worries, get a fresh perspective and feel happier in just a few minutes a day. How are you feeling: Insecure? Excited? Rejected? Meh? Happy? Stressed? Anxious? Heartbroken? Angry? Sad? The first step to a clearer mind is to recognize the emotion that you're feeling. Research shows that when you label the emotion you’re feeling it allows emotional processing to start taking place helping you to feel better. Remember, there is no such thing as a bad emotion, they’re all temporary. Slow, smooth breathing is the quickest and easiest way to calm your stress response and activate your rest and relax system in just a few seconds. Use the "belly breath" technique in a five-count breathing pattern. Relax your shoulders. Inhale slowly for 5 counts, exhale slowly for 5 counts. Remember to belly breathe, letting your stomach expand and shrink back down with each breath. Imagine a paper bag slowly filling with air, and then deflating. Focus on breathing this way for at least 30 seconds. This is your moment to unclutter your mind and release any thoughts or feelings you’re experiencing. Whatever your emotion is, write down why you feel this way: What’s been going on? What are you stressed about? What happened to make you angry? Write down the first thing that comes to mind. Journaling activates the computer side of your brain which helps calm the emotional center further helping you gain more clarity. Have it written down? Now rip that paper up. Release the emotion. “This is when you redirect: What do you have? What can you be grateful for?” says Jamie. Get your happy hormones flowing by writing a gratitude list. This part of the routine is about focusing on the positive as it’s easy to forget the good things in our lives (especially when we’re stressed or anxious). Write down something or someone that makes your life better. What are you grateful for today? Now it's time for a quick mindful mini game that helps you get your zen on. From art therapy to quick focus challenges, there are many activities that can disrupt thinking and bring you back feeling more balanced. Draw your favorite memory, your happy place or a smiling face. Play a game like a crossword puzzle or a round of Candy Crunch on your phone. Listen to your favorite song and hum along to it. We challenge you to forgive someone today — you don’t need that extra baggage. What would you tell a friend if they were feeling like you do now? We challenge you to let someone know that you appreciate them. Self-love time: Give yourself a compliment. “What can you do for someone else? In a generation that’s been indoctrinated with selfies and narcissism, if you’re thinking about someone else you can't be worried about your own problems,” says Jamie. Studies have also found that those who think of others the most were happier. This is your moment to make someone’s day with a “thinking of you moment.” No matter how we feel, we always have the power to make someone else feel better, says Jamie. Make someone else feel better by sending them a text or email with a positive note.